For your first session I will create a bespoke blend, small enough to fit in your pocket or bag – it can be your little ray of sunshine on a rainy day. 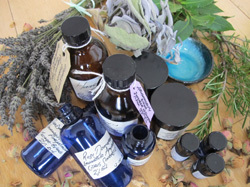 In aromatherapy it is important that we place just as much emphasis on the power of smell as we do the power of touch, therefore if massage is not appropriate for you (CONTRAINDICATIONS) then I am more than happy to give you a full consultation and create a bespoke blend for you to use yourself. Aromatherapy is unique in that it gives you something that you can do for yourself, something that is both enjoyable and empowering. I will help you to discover which oils work for you personally. Each essential oil has a unique personality and it is fun and very comforting to find an essential oil that works in harmony with you. 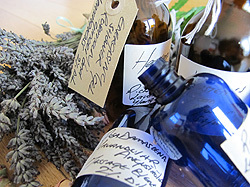 The beauty of Aromatherapy is its versatility, and massage, as beneficial as it is, is just one aspect. Aesthetic - Ultimately what I create has to smell good otherwise there is a high chance you will take your blend home and never use it again. Involving you in the process of blending is crucial. If I know that you love the smell of geranium, for example, than I think your treatment has already begun. Clinical - After a thorough consultation I will create a bespoke blend that will have maximum benefit on your health and well being. I apply The Five Element approach to aromatherapy and blending. The Five Elements, along with Yin and Yang, is one of the main theories of Traditional Chinese Medicine (TCM). These elements are the theoretical basis of the unique bond between man and nature. The first of the five elements is Water, followed by Wood, Fire, Earth and finally Metal. Each individual is a mixture of all five elements or forces and the key to staying healthy is to keep the five elements in balance. Mr Happiness - Happiness Massage oil for men - Includes orange, geranium, ginger and coriander. Hippocrates believed a daily aromatic bath and scented massage would promote good health.